The international medical journal Rad HAZU (Croat: Rad Hrvatske akademije znanosti i umjetnosti: Medicinske znanosti) provides wide coverage of research in all aspects of clinical medicine, public health, dentistry, pharmacy, nursing and translational medicine. 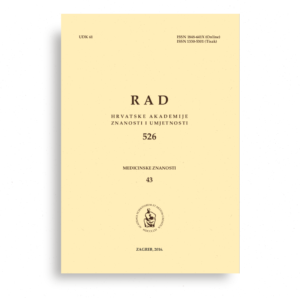 The Rad is published biannually since 1951. Our mission is to bring physicians the best research and information at the intersection of biomedical science and clinical practice and to present this information in understandable and clinically useful formats that inform health care delivery and improve patient outcomes. Authors are invited to submit their manuscripts or contact the Editorial Board, if in doubt about any aspect of scope or content of a proposed contribution.